Paper fasteners are available in a range of sizes. They are ideal for holding pages together. They are supplied in a variety of colours. Treasury tags are used to hold pages together. They vary in length according to the number of pages that are to be held. They are sometimes used to bind several pages together. 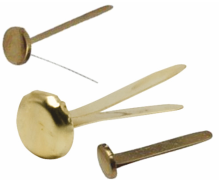 Prong Paper Fastenings. These are designed to hold ‘firmly’ sheets of paper together. They fit standard hole punch sizes. They are normally supplied as ‘metal’ and ‘plastic’. The first paper clip design was patented by Samuel B. Fay in 1867, in the US. They have been used for more than a century and are still the most popular fastening. Used to temporarily hold sheets of paper / card together. 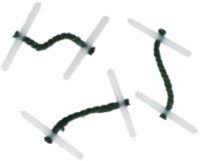 Staples are a common accessory, used to hold pages together, quite often permanently. They are supplied in a range of sizes. A stapler is charged with staples and individual staples are ‘pressed’ in position. 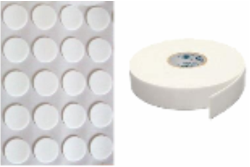 Self adhesive pads are useful for hanging posters on walls, joining card to card and for sticking on the underneath of furniture, to help prevent damage to surfaces. Slide binders are used to hold pages together, usually forming a booklet. The advantage is that they slide over the paper and can be removed relatively easily, when required. They are supplied in a range of colours and sizes. 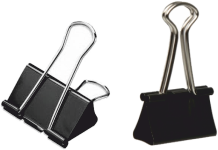 Fold Back Clips. These are used to hold papers together and are similar to bull dog clips. Simply fold back the chromed arms to open the clip and slide over the papers. Then, return the chromed arms back to their original position.